Volume plays an important role in confirming price movements. It is sometimes difficult to track this relationship on a normal bar chart with volume plotted in a separate slot below. This is overcome by plotting price and volume activity on a single chart. 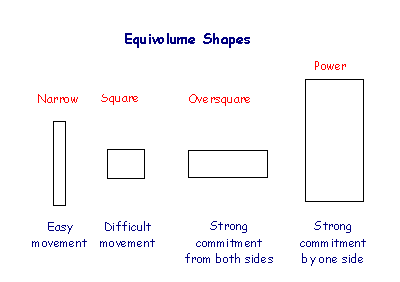 Equivolume was invented by Richard W Arms Jr. and introduced in his book Volume Cycles in the Stock Market. 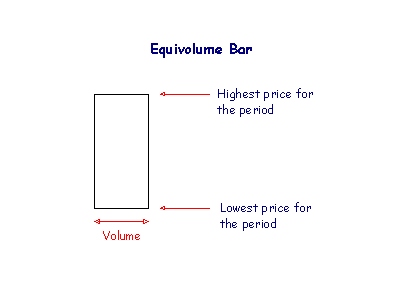 The height of each bar (or box) represents the trading range for the period - the highest and lowest prices recorded - while the width of the bar represents volume traded during the period. We can tell a great deal about the commitment of buyers and sellers from the shape of the box. An oversquare day shows that buyers and sellers are both strongly committed to their positions. This is a powerful reversal signal after a strong trend. Power days show strong commitment by buyers in an up-trend (or sellers in a down-trend) and serve as confirmation of breakouts above resistance levels (or below support levels) in a chart pattern. Incredible Charts have added closing prices to Equivolume charts. The position of closing price in relation to the day's range indicates whether buyers or sellers have control. Close near the day's low shows that sellers have taken control. Close near to the day's high shows that buyers outweigh sellers. 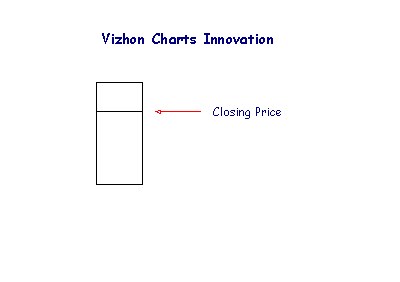 Closing price is represented by a horizontal line across the bar. The key is that we have shaded the area above or below the closing price, depending on whether the close is higher or lower than the previous day. 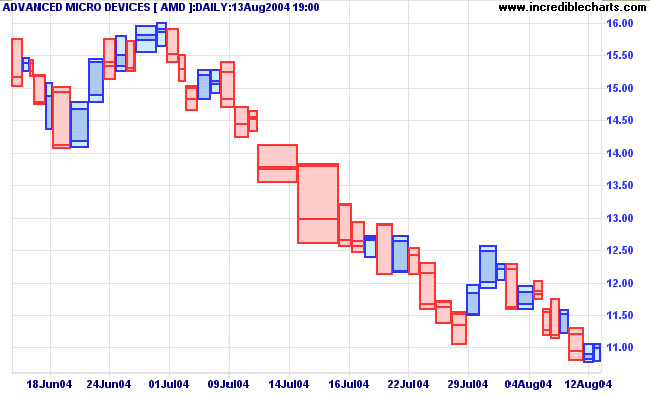 This enables you to tell at a glance whether a trend is strong or weakening. Bars that are mostly lighter shade signal that a trend is weakening. If closing price is higher than yesterday's close, the bar will be colored blue/green. The area below closing price is shaded darker than the area above the close. 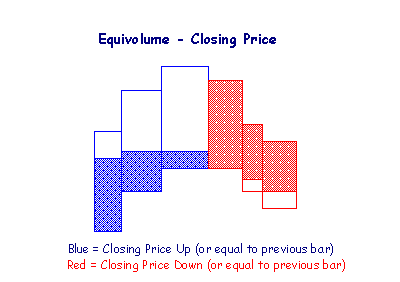 If closing price is lower than the previous close, the bar is colored red. The area above closing price is shaded darker than the area below the close. So closing price is always the top border of the blue shaded area (green is used on some charts) or the bottom border of the red shaded area (in a down-trend). It sounds complicated but is easy to follow on the chart. Take a look at the figure below. You can see the trend weakening on the 2nd and 3rd bars - they are mostly lighter shade. 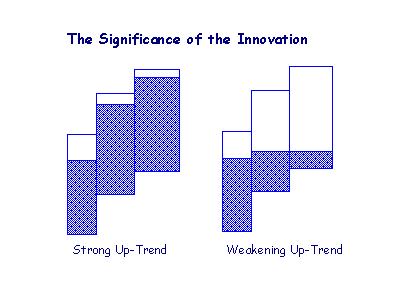 On the 4th bar there is a lower high and the close is lower - signs that the trend is uncertain. The 5th bar signals the start of a down trend and is confirmed by the 6th bar. Same as the previous bar if the Open and Close are equal. Same as the previous bar if today's close is equal to yesterday's close.